This topic is a little step away from my usual content but the question has come up a couple of times lately and I thought I'd post a "How To" guide. Many owners are content with using their TV for PlayStation 3 games and Blu-ray DVD. Some will be taking advantage of recent advances in HDTV and using an HDMI cable, while others are stuck with standard TV via an RCA AV cable or SCART (in Europe). If you own a recently manufactured LCD monitor, then it's possible that you could take advantage of the PS3's HD capabilities without having to shell out for a new HDTV. Many LCD models feature a DVI input (digital) as well as SVGA (analog). The PlayStation3 has two different audio/video outputs. The HDMI (High-Definition Multimedia Interface) port will transmit uncompressed digital data for video and audio. We can covert this to a monitor friendly format by using a HDMI->DVI cable. This cable drops the audio data but allows the digital video data to plug into a standard monitor DVI input. I'm using one of these cheap HDMI->DVI cables into a LG FLATRON W2042T and I'm more than happy with the result. The monitor also accepts SVGA which I use for my PC and switch between the two using the monitor's "Source" button. The HDMI->DVI conversion drops the audio data - since most monitors don't support audio, especially not digital audio, you're probably going to need something else to produce the sound. The PlayStation 3 simultaneously produces output on both HDMI and AV channels, so we can use the AV audio feed. In my set up I am plugging the Red and White RCA leads into a Logitech X-230 Multimedia Speaker System via an adaptor that came with the speakers (2x RCA female to stereo 3.5mm female). 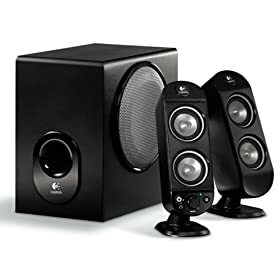 This is probably the best sounding system in the lower price bracket and features a handy headphone jack on the front of one speaker. 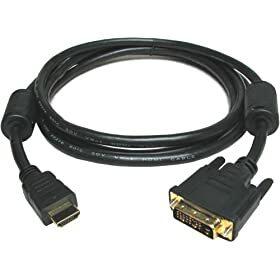 As I understand it, this technique will not work with the the XBox 360 as it only transmits data on either HDMI OR standard AV. Apparently you can plug your Xbox 360 into SVGA using this Xbox 360 VGA Component Audio Cable. I've not seen the output quality, but from what I've read it's quite acceptable, although some users experience ghosting on text. RSS is a tricky thing to measure, requests are not tracked like normal webstats, and are commonly anonymous or via a proxy. The frequency of requests is dependant on the user's feed reader and could be daily, weekly, hourly or even every minute (or anything in between). This is why it's important to have a good grasp of how much bandwidth and processing resources your RSS feeds are using. The easiest way to offset the processing cost is to cache your feed. Depending on your site's publishing schedule and implementation, the caching period and method used will be different. The basic idea is to dump your feed into a file and serve that. On each request check if the cache file exists and if it is younger than 15 minutes. If not then build the feed and dump it into the cache file, ready for the next request. Depending on the frequency of requests, this can reduce your feed building resource cost considerably. Feedburner has been providing RSS feed management tool since 2004. By October 2007, they reportedly hosted over a million feeds for 584,832 publishers. In June 2007, FeedBurner was acquired by Google Inc., and shortly after two of their popular PRO services (MyBrand and TotalStats) were made free to all users. By August, 2008, Google had completed migrating FeedBurner into its group of services. FeedBurner works very well with the major blog publishing sites, but it's also worth investigating if your site is standalone. The initial payoffs of using FeedBurner is that they can help you get a handle on the size of your subscription base, and will cache and serve your feed, thereby absorbing much of the processing and bandwidth costs. There has been quite a bit of discussion about the accuracy of subscriber stats provided by the FeedBurner service. As stated earlier in this article, RSS stats are problematic due to the plethora of clients and the complications of anonymity and proxy services. Having said that, they service offered is a lot better than no stats and in my opinion the benefits outweigh the cost many times over. One of the important tips about integrating FeedBurner is to make sure that your subscribers still subscribe to your site's feed URL and are redirected to your FeedBurner URL. This way, if you ever decide to drop the FeedBurner service, then you won't leave your subscribers stranded with a defunct FeedBurner URL. Google has been quite open about this issue, if you know where to look. If you are redirecting traffic you need to make one small change to your FeedBurner options to make this work properly - but it's not that easy to find... Click on the Optimize tab for your feed, and then BrowserFriendly in the Services menu. At the bottom of the form, in the Content Options section, there is a link with the text "Use your redirected feed URL on your BrowserFriendly landing page". Click on that and then enter your site's feed URL. This change should result in most subscribers using your site's URL, however, this still doesn't seem to work correctly with Firefox's Live Bookmarks. I haven't found a decent work around for this yet, or even much evidence that it is an issue, but for me it never works, so be aware. Even the "ClearFeed" landing page is somewhat confusing when Live Bookmarks are used, which is a concern considering Firefox's popularity. Search Engine Optimisation (SEO) is often thought of as a mystical dark art. Many folks are making a good living off giving advice on how to increase your ranking in the major search engines, some of them even know what they're talking about. In many cases the "tricks" involved are common sense and can be implemented without too much trouble. The clever part is recognising what is the best approach for each particular site. Think about what terms people would type into a search engine if they wanted to find your site. It's better to get 10 visitors who will be interested in your content than 100 visitors who will immediately leave and never return. Compile a list of terms you would expect your site to be well ranked for and target those terms. Make sure these terms appear in your page's body text. Keep the list in a spreadsheet and record your Search Engine ranking so you can measure improvement. Make sure you have a decent chunk of crawlable text. Webcrawlers don't index text if it's just in an image. Make sure the content includes the terms you want to be found for. If your product or service is regional then include those details on every page (the page footer does nicely), then you'll be more likely to be found when people search for "kitten jugglers London SW15". The content of the page's <title> tag is taken as a description of the page content. This is a key index for your pages. Make sure the title is clear but succinct. Limit it to 5-10 words, including your company name. Don't use the same title on multiple pages or they may be grouped as one page in search engine results. Never ever use click here links. Link text is one of the best indexing opportunities you have, don't squander it. The text in links to your pages are treated in a similar way to page titles but links to your pages are aggregrated. Do use the keyword and description metatags. Keep it clear and simple. The keywords tag is said to be less used of late due to heavy abuse, but Yahoo claims to still support it. The description tag should provide a concise explanation of your page's content. If your website includes mulitple languages, translated content or is not in English you should consider also using the language tag. If your site is brand new and hasn't been indexed yet, you can get the ball rolling by adding it to the Open Directory Project. Search engines are an incestuous bunch feeding off each other and this is a good entry point as it's used by AltaVista, A9, AOL, Ask, Clusty, Gigablast, Google, Lycos, MSN, and Yahoo. Google's Webmaster Tools can tell you if anything is going wrong on your site that could be affecting your search ranking. You can read about Webmaster Tools in an earlier post.